At CWR there is an interview with Archbp. Alex Sample of Portland. Among the things he addressed are sacred liturgy and sacred music. […] Some have said that the sacred liturgy is my personal hang up, that I have an obsession with it. I reject that view, because it’s not merely my opinion that the liturgy be given the highest priority, but that of the Church. Sacred music forms an important part of that liturgy. I hope, in time and with patience, to address this topic with our clergy and lay leaders. CWR: You recently celebrated Mass in the Extraordinary Form during a conference at the Brigittine Monastery in your archdiocese. What brought you to this conference and what interest do you have in the Old Mass? Archbishop Sample: We have wonderful group of lay people in our archdiocese with an interest in Gregorian chant who put this conference together. They wanted to introduce Gregorian chant to the people in accordance with the mind of the Church. Vatican II, in fact, indicated that chant should enjoy “pride of place” in the liturgy [in Sacrosanctum Concilium]. The conference organizers wanted to experience Gregorian chant within the liturgy and asked me to celebrate the Mass there according to the Extraordinary Form. I had no hesitation to do so when I was asked. If we do not revitalize our liturgical worship of God, nothing we do in the Church will bear lasting fruit. This entry was posted in Liturgy Science Theatre 3000, Our Catholic Identity and tagged Archbp. Sample, Archd. Portland. Bookmark the permalink. As a lay member of a liturgical commission that functions as a consultative body in our diocese, I am thankful for the witness of Pope Benedict, Archbishop Sample and many others to whom I may turn for solace when I find myself in conflict with those who are not so inclined to preserve the Church’s teaching regarding the Sacred Liturgy. I plan to forward the excerpt you have provided to my fellow lay and ordained members of the commission with the faint hope that more of them will come to appreciate the facts and not be driven by their feelings or cheap sentiments which reek of the worst aspects of the liturgical revolution that pretended to be Catholic but was/is, as readers here surely know, anything but faithful to Tradition. To Warren, in addition to sharing your sentiments of both hope and disappointments, I would only wish to respond to your excellent comment that we can also find solace in newer priests and seminarians, who seem increasingly immersed in the “Benedict XVI school of liturgics.” Whenever I find myself visiting a new church, and see the Benedictine Arrangment on an altar, I immediately know that I am spiritually among friends. This seems to be my experience ever more frequently. Think of how much has changed in just the last 10 years, despite any perceived or concrete regressions presently. 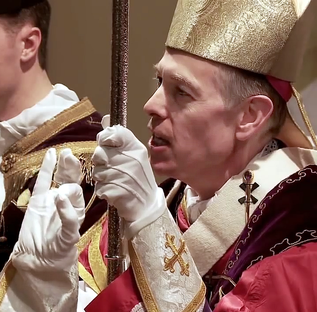 And if the archdiocese of Portland, OR should one day ever have its first Cardinal-archbishop… Or San Francisco or Philadelphia (for his particular service and orthodoxy, not so much for his expertise in liturgy)… then this would be a dream come true! This along with the dip into the Trump pool just publicized on the news. Six point 02 times 10 to the 23rd, Amen. Much as I applaud Bishop Sample’s efforts, I think it is critical to dispel Catholics of the notion that the TLM is ‘the ancient’ liturgy. The TLM is is our birthright. Much like having parents is not an ancient arrangement – it is natural. It is what God supplied. i.e. Having mom stay home with the kids is not an ‘ancient’ method. This ongoing gift of the TLM that developed naturally is not the recapturing of the ‘ancient’. This embracing of the TLM is giving back to the people what was forcefully TAKEN. If Bishops could embrace that reality and teach it to the people, I believe there would be a greater understanding and an increased desire to regain what is ours. For we were robbed. No doubt about it. So true about the newer priests and seminarians. For the most part, these young men seem to be entering their vocation out of a desire to SERVE the Church rather than “re-imagine” it, as so many of the 60’s, 70’s, and 80’s era. The long-term impact of this trend cannot be overstated. As these new priests rise through the ranks, they will edge out the aging radicals and become more vocal in their support of tradition and authentic Catholicism. The liberal wing of the Church is going through exactly the same evolutionary process their compatriots among the mainline Protestant denominations have already experienced. The natural endpoint of modernism is a diminution in faith. Now that the seminaries are no longer lodges for homosexuals and pedophiles, there simply isn’t much allure to the priesthood for your average liberal, modernist post-Catholic. That leaves the ground open to this new breed of orthodox (small “o”) youngsters. Lucifer had his availing time, as foretold to Pope Leo XIII. He failed to destroy Christ’s church, though he did damage it severely. Just to put a finer point on my message above: the Devil will find it harder to cultivate agents within the Church going forward. There are not so many Bernardins, Weaklands, Kaspers, Daneels, and Hubbards in the new crop of priests. And the cheap grace and shallow theology that seemed so cutting edge and “revolutionary” back in their day is now much easier for people to discern as false teaching. Although 97% of the time I am either attending or serving some aspect of the Ordinary Form, I thought perhaps CWR journalist Jim Graves could’ve (should’ve ?) chosen a better way to express the Extraordinary Form, rather than calling it the “Old Mass.” (One shakes that habit easily enough when they start frequenting Fr. Z’s blog on a regular basis). We find these two – become one, in the clebration of the Holy Sacrifice of the Mass. Several posts ago we had a thread dealing with particular abuses concerning the Sacred Species : These things just don’t happen when we understand precisely Who is present in the Holy Eucharist. Some of the instances of abuse stem from people being badly instructed , but if the liturgy of the Mass is always done properly and reverently, it repairs an awful lot of people’s lack of understanding about Who is actually present in the Eucharist. Sacred Liturgy is one of the greatest teachers of our faith that we have – because liturgy (when done properly and reverently) is actually living and celebrating our faith – not just reading or speaking about it. I believe it’s all about retaining that sense of the Sacred and keeping it right there where everyone can see it and drink it in. We need to guard against (personally and collectively) promoting any casualness towards the Blessed Sacrament. I’m sorry, but I don’t see how this is true, although if you can point to a statement arguing such from someone like Pope Benedict, maybe that would help me understand what you’re getting at. I definitely agree that the TLM should not be treated as inferior because it is “ancient.” In fact, compared to the Church itself, what we today consider the traditional Latin Mass is decidedly *not* ancient. The Tridentine form of the Latin Mass dates back to the Council of Trent in 1570 – less than 1/4 of the history of the Church. Its form was not supplied by God, but by the Church, seeking to better, and especially more universally, carry out Christ’s order to “do this in memory of Me.” My understanding is prior to that time, there was significant regional variation in the liturgy of the Roman church, even if generally not as substantial as the difference between the Roman rite and the Eastern rites. In 1570, these variations were standardized at the direction of Pope Pius V, although the better established Eastern rites were allowed to continue their existing traditions. So since the Church has significant discretion over specifically how to carry out the command to “do this in memory of Me,” even the to point of allowing traditional Greek, Serbian, Coptic, and other rites that in some cases are believed to trace back to individual apostles to continue in usage, I don’t see how the traditional Latin Mass is a birthright. Arguably a reverent, beautiful liturgy is a right, but that can not be as specific as the Tridentine rite, and certainly not the same kind of right as the natural right to having parents. The latter was instituted and implemented by God from the beginning of creation, while the Eucharist specifically was instituted by God long after creation, but the Mass it is celebrated within was implemented by His apostles and their successors. What is now called the Extraordinary Form does not date simply to the Council of Trent. Sure, it was codified for most of Western Christendom at the Council of Trent, but the liturgical form in question dates back to centuries before that point. Trent didn’t formulate a generalized rite out of thin air. The Roman Rite had already been developed into its “Tridentine” form for a good few centuries, if not longer. And at any rate, those variations within the Latin Church that existed prior to the Council of Trent had more in common with the current Extraordinary Form, and with each other, than any of them did with the current Ordinary Form. We just don’t hear such things in church or our education. Is it any wonder that so many obtain no benefit from the Mass and so many ignore it? If we never talk aboit it as something that transcends performance, how can we expect it to be loved? I agree that we have a right to the Mass according to the Roman Missal of 1962. As Benedict XVI explained in Summorum Pontificum, it was never abrogated and remains a treasured usus of the Latin Rite with which all Latin Catholics should be familiar. Further, as more research is done into the how and why of the Novus Ordo, we might find ourselves agreeing with H.J.A. Sire in Phoenix from the Ashes that it was illegally concocted and promulgated. Illegal does not mean invalid, but consider its fruits. @ Michael, that is more or less my understanding, although I’m admittedly unclear exactly how close the older variations were to the rite promulgated in 1570. Likewise, for the even more significantly different liturgies in Greek and Coptic descended from the work of St. James and St. Mark. Use Father’s Amazon link to get a copy of A Short History of the Roman Mass By Michael Davies. It’s short, inexpensive (Kindle or paperback) and it may answer questions about how far back current practices in the Roman Rite go. Liturgy in much of Western Washington is ghastly. His Excellency Archbishop Sample, along with MANY other faithful Bishops, have been sidelined for the last Two years, eleven months, five days. That will come to an end when, “God hits the shift key and closes parenthesis”. All I can say from my point of view, is they are not, going quietly into the night. “If we don’t have the liturgy, what do we have?” What more needs to be said? The Liturgy is also what sets us apart and makes us more than just some other social justice organization or food pantry. Even atheists can do those things. It’s what makes us a church. Ann Malley hit the nail on the head, as did many others. The history of the Liturgy/Mass is very interesting. The oldest liturgy seems to be St. James in Jerusalem written after our Lord’s death, developed more by St. Basil, & further developed by St. John Chrysostom and currently in use today by the Eastern Orthodox (Greek East) Church. Amen! May Archbp. Sample’s tribe increase. @ majuscule – Thanks. I added it to my cart. Hopefully I can work it into my reading backlog soon. The Liturgy of St James is still used by the Syriac Churches, like the Maronite, Malabar, Malankara, etc, Churches.